Technical Tip: Make sure JS1B & JV1B Jumpers set as old drive. We can offer A06B-6079-H204 for sale on same day exchange service also UK in-house 24 hour repair and testing on this SVM2-12/40 Dual channel FANUC Servo Amplifier Module input 283-325 Volts (3.4kW) and has a maximum output voltage of 230 Volts. The single channel axis operates with a rated output current of 3.0 Amps on L axis and 12.5 Amps on the M axis. It can use both type A and type B interface selectable buy the JS1B & JV1B jumpers on the front. This A06B6079H204 drive uses the same power module and power card as the A06B-6096-H204 with a different CPU board. Main FANUC PCB Boards inside are A20B-2100-0931 and A16B-2202-0770. 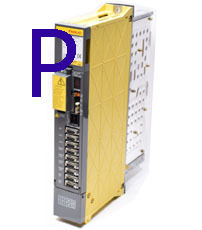 As well as offering an off the shelf same day part exchange program we also repair, test and service this servo common faults we see are Fanuc Alarms IPML, HCM, 1, 4, 6, 9, 8, IPMLM, and Alarm 8. all our UK 24 hour repair service and testing is done under closed loop via Fanuc CNC Controls. but for speed go for our same day exchange program. We have a growing inventory of over 35,000 FANUC OEM parts in UK stock ready for immediate worldwide delivery. By utilizing our services, you can save up to 60% off OEM prices. Request a quote today Or Call 01422 310259 and one of our FANUC UK customer service team will assist you. ©2018. We are not Affiliated with any FANUC CNC or GE FANUC UK or Fanuc CNC UK Ltd Companies.